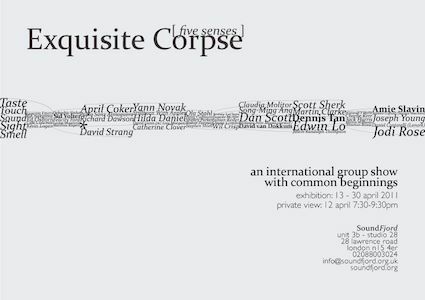 In April 2010, before SoundFjord opened it's doors to the public, we devised a plan for an exhibition, populated by artists' works created using the âExquisite Corpse' model as a point of departure. 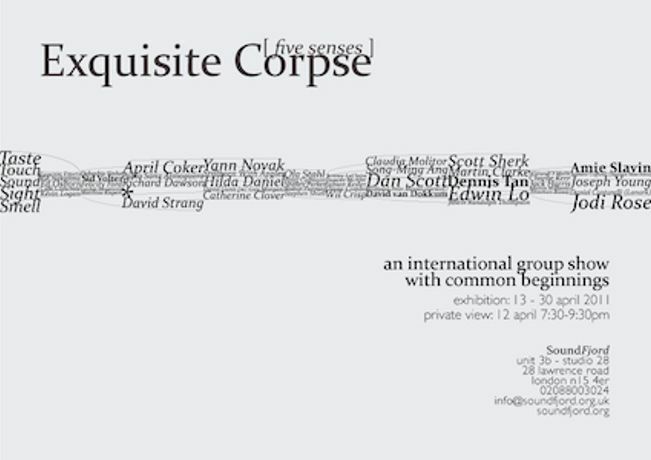 The Exquisite Corpse is a method made popular by the Surrealists, and is similar to Consequences, the old parlour game. Words, images or sounds are collectively assembled in a specific way, using rules set in advance, for instance, one is only allowed to see/hear the last section/measure of what was previously contributed. This exhibition documents the works produced, and finally, reveals the artists who worked on the project and whom have hitherto remained anonymous.